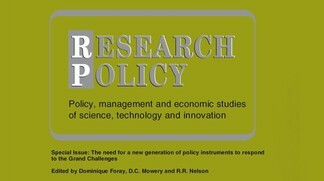 Research Policy has published a special issue on the need for a new generation of policy instruments to respond to the Grand Challenges.
" Nevertheless, mission-oriented R&D programs can be of great value if they are well designed to fit the particular challenge and the context. Second, we believe that familiarity with a range of existing mission oriented R&D programs can provide useful guidance for the design of new programs aimed at these challenges."